Throughout the earliest periods of Islamic history, we find women in important positions within society, women as market inspectors, such as SamrabintNuhayk al Asadiyyya who used to go around the market commanding good and forbidding evil. Or Ash-Shifabint Abdullah, an early doctor or healer who was also involved in public administration and whose name is very present in early Muslim history. In these cases, the examples of our sisters who find contentment in domesticity cannot be used as a whip to flog us. It is not the only model of female emancipation. The Prophet (saw) daughter Fatima (a.s) was more homeward inclined - but Khadija, his first wife was a powerful businesswoman who employed her husband before proposing to him. Umm Salama was a powerful figure whom the Prophet consulted in his decisions and who participated in a number of battles. Women are not the trampoline from which men get to launch into the world. There is saying that really grates on me, that “behind every great man is a great woman”. Why should she be behind him, in the shadows, easing his advances and successes - if love and partnership means anything, it means supporting one another in your objectives, it is cushioning each other’s’ falls, it is easing each other’s’ burdens. Of the many successful men I know, how many of them have dutiful, devout wives at home who keep the wheels turning in order for these men to go out and do their thing. You cannot simultaneously bemoan the lack of women’s contribution to society and expect them to achieve the same things as men, whilst bearing the additional burdens - or as I like to call, the second full time job - of running a home and caring for a family, on their own. God created men and women to build life together and to complete one another all lifelong. Hence, Islam opened the door to women to wade through all the fields of struggle in life side by side with men, supporting each other, helping, and completing one another. Moreover, Islam did not separate them in roles, the thing that is clearly shown in His saying: “The Believers, men and women, are protectors one of another: they enjoin what is just and forbid what is evil.” (9:71). Once we understand that justice embraces everything positive in life, and that evil comprises everything negative in it, we will then realize that men and women are partners in building up life. And just like men are responsible of the society, women also are equally responsible of the society they live in. So, outside the framework of the specifically motherhood and fatherhood characteristics where they perform absolutely different functions, men and women have vast areas to conquer, building life shoulder to shoulder as human beings, equal in humanity. Accordingly, we can say that Islam had opened the door to women to enjoy life as a whole, in contrast to what some people may assume that it had tied them down in their characteristics as females. The saying that Islam ties the woman down to a homemaker role is a frequently heard reflection on the way things are, and this is why it is worth discussing. But before going into the depth of the subject, we should point out the presence of two kinds of rulings in Islam: The first kind is the binding rules that necessitate the person to do something or not to do it, and they are called the obligation and prohibition rules. And the second is the rules that urge the person to do something but do not compel him to doing it; or exactly the opposite, wishing him not to do something but at the same time do not prevent him from doing it, and they are called the preferable and the detested, or the rules that allow the person the possibility of choosing whether to do or not to do and they are called the allowed. Well, does Islam oblige the woman to be a housewife before and after marriage? According to Islam, not a single person whether a father, a mother, a brother or any relative, is authorized to legitimately oblige the woman to manage domestic work in her parental house before marriage. So, housework is not imposed on women just like neither the father nor the mother has the legitimate right to oblige the boy to handle housework. Yes. She can take on this charge if she willingly volunteered to, out of the sense of responsibility towards the house that is taking care of her. And when the girl becomes a wife, the fact that she manages the domestic work in her house or does not, will also remain a voluntarily matter that is up to her to decide. The contract of marriage does not bind women, from a legal aspect, to do housework, not even to rear her children and take care of them, unless the two married people worked on including the performance of these works in the marriage contract under special terms. 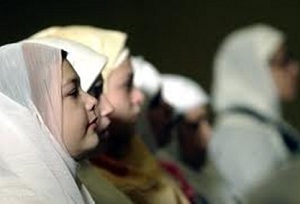 But Islam does not consider that women’s housework as one of the marriage contract articles, and it also does not require the women to carry out any kind of jobs outside home to support her family or to contribute in supporting it. On the basis of the marriage contract, man can demand nothing from his wife but the rights to the private marital relationship and all what is related to it. Anything other than that, such as arranging the household affairs and bringing the children up, would not be imposed on her.